Those interested in macroeconomics should consider to consult a variety of introductory text-books. The subject is too diverse and controversial to trust a single author. The book Volkswirtschaftslehre, written by Michael Heine and Hansjörg Herr, deserves a prominent place on everyones reading-list. It is really regrettable that the economic faculties of the Dutch universities have a one-sided focus on the anglosaxon science, and ignore this book. For that matter the same fate is undergone by many other text-books, that are written on the European continent. That is unjustified. For instance the book Volkswirtschaftslehre is certainly more up to date than the well-known work by P.A. Samuelson and its quality is higher than the illustrious work of N.G. Mankiw. Volkswirtschaftslehre is a complete book and this is apparent from its size, well over 700 pages. It contains comprehensive chapters about the neoclassical micro- and macroeconomy, and about the Keynesian macroeconomy. In the preface the authors motive this division as a conscious choice, for "in most introductory text-books the different economic schools are not separated. Often only one doctrine is explained". Heine and Herr analyse the leading paradigms, so that the reader can make his own political judgement. After reading the book it will not vanish in the attic. It remains a source of reference. The authors start the explanation of the microeconomy with the historical exchange model of Léon Walras, a Swiss in spite of his name. That is an original choice, for the findings of Walras are merely mentioned in passing in the book of Samuelson, and Mankiw omits the name altogether. And yet the economic science can hardly be understood without knowledge of the price model of Walras. In this way Heine and Herr preserve the reader from hours of despairing fantasies about the essence of the economy1. Besides the price model of Walras is a nice step to the classical price theory of Sraffa. This theory, also called the neoricardian theory, is relevant, because she criticizes the neoclassical macroeconomy. Over more than half a century, until halfway the sixties of the last century, the neoclassical variant exercised an ideological dominance in the macroeconomy. The criticism by Sraffa came as a bolt from the blue. Thanks to his work, the neoclassical variant has lost much of its original appeal. But scientists are as conservative as common people, and do not like to modify their ideas. The book of Samuelson mentions the problem of the neoclassical macroeconomics only in passing, in a footnote, and the book of Mankiw does not tell it at all! On the other hand, the book of Mankiw does elaborate on the politics of Ronald Reagan (at least in my edition)! This ostrich policy seems to be typically American. For most German and French universities have included the modern insights into their curriculum. Later the neoclassical macroeconomy has been repaired by an adapted formalism, which was developed by among others Arrow and Debreu. Heine and Herr also clearly explain in Volkswirtschaftslehre this version of the neoclassical theory. They conclude that the formalism of Arrow and debreu is sound with regard to its analysis and mathematics. However, they state that in practice this modern formalism is difficult to apply. Notably the claim must be abandonned that the market economy will by itself bring about the optimal state. Here Arrow and Debreu miss their aim. Just now it was remarked, that the book of Heine and Herr is fairly complete. The chapter about economic policy treats among others the monetary policy, the wage policy, and the fiscal policy. A separate chapter analyses the global economy. A large variety of subjects is included, like the monetarism of Friedman, the labour theory of value of Marx, and portfolio models for the various forms of property. Heine and Herr remain scientists. They abstain from a political standpoint or from a certain doctrine, but try to find the best theory, based on objectivity. It characterizes them that they end each subject with an paragraph titled "Critical evaluation". It confronts the reader with the fact, that all this knowledge is on balance nothing more than an intellectual mind game. That is useful, albeit somewhat disenchanting2. The pedagogical qualities of the book are open for discussion. Certainly, all is explained carefully and plainly, this can not be doubted. But no attempt has been made to bridge the gap with the reality. There is no support from industrial statistics, or even examples from practice. Cartoons are lacking, as well as anecdotes or striking text boxes. This may sound rather unattractive. But although the content is a bit dry, it is also solid. This can not always be said from text-books of other authors. Besides, the occupation with macroeconomics requires receptivity for the dry jargon of policy makers. 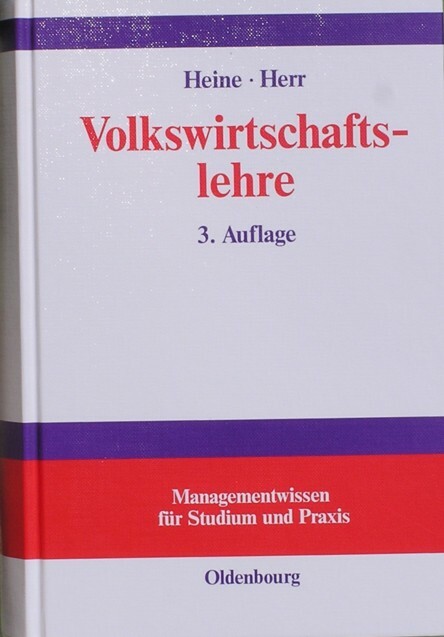 A year ago this copy of Volkswirtschaftslehre was available for less than forty euros. That is dirt-cheap for such a text-book, with nota bene a bright white hard cover. At last here is an investment, that is definitely profitable. But all pros have their cons, and the publisher Oldenbourg had to cut down expenses somewhere. Thus all is in black-and-white print, even the figures. It is true that the figures are clear, but they are also rather sober. The layout of the formulas reminds of typewriters from the eighties of the last century. This does not annoy your reviewer, on the contrary, it mollifies. But to be fair, if macroeconomy is not your thing, then the layout will not tempt you to a rummage.